Kiyoshi makes her planned return to action after a 10-week absence in the Moyglare Stud Stakes at the Curragh on Sunday. Connections of the Charlie Hills-trained filly decided to put her away and wait for this Group One over seven furlongs after she won the Albany Stakes in scintillating style at Royal Ascot. She faces six rivals as she attempts to give British raiders back-to-back Moyglare victories after Richard Hannon's Sky Lantern landed this prestigious prize 12 months ago. "It's been the plan to run her in this race since Ascot," said Lambourn-based Hills. "It's an obvious race to go for, it's an ideal stepping-stone and she's been pleasing us ever since Ascot, but she needs to prove it again." David Redvers, racing manager to owners Qatar Racing, is hoping the ground is not too quick for the daughter of Dubawi. "The filly's flying over on Saturday and Charlie couldn't be happier with her," he said. "She's got the best form on offer this year and we just hope she runs her race. If she does we're hopeful she will be very competitive. "The step up to seven furlongs should suit her ideally. "My only worry would be if the ground was too fast being by Dubawi, we wouldn't want to jar her up or anything, but I'm sure they will be doing an excellent job on the ground to make sure there's no jar in it." There is a second British challenger in Rizeena, who has been pretty busy since winning the Queen Mary Stakes at the Royal meeting. The Clive Brittain-trained filly followed a second place to Lucky Kristale in the Duchess of Cambridge Stakes at Newmarket's July meeting with a creditable third to the speedy American juvenile colt No Nay Never in the Group One Prix Morny at Deauville. "She's in great form. Clive's (Brittain) very happy with her training, her weight is good and he's never been more pleased with her," said Bruce Raymond, racing manager to owner Sheikh Rashid Dalmook Al Maktoum. "Obviously it's going to be tough with Charlie Hills' horse, who looks a worthy favourite, but our filly is very good. "She ran very well at Deauville last time but this seven furlongs looks most suitable for her." Debutante Stakes winner Tapestry is Aidan O'Brien's main hope having been supplemented for 22,500 euros at the confirmation stage. The Ballydoyle trainer is seeking a seventh Moyglare victory. "It was always the plan to go there (Moyglare) with her," he told At The Races. "She's won her two starts very nicely. She's in good form and everything seems very well with her. "It looks a good race and it will be a good experience for her." 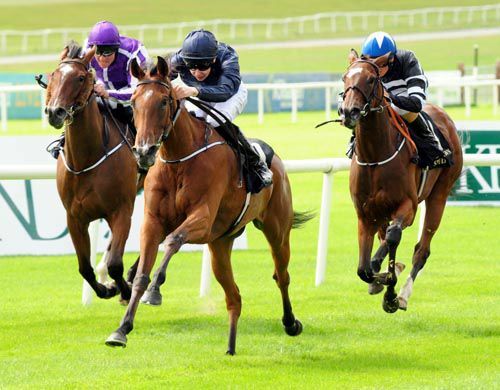 O'Brien also saddles Wonderfully and Perhaps, who were first and second respectively in the Group Three Silver Flash Stakes at Leopardstown six weeks ago. Dermot Weld lifted this prize back in 1987 with Flutter Away and looks to Carla Bianca, who was runner-up to O'Brien-trained odds-on favourite Australia over the course and distance on her only start in July. 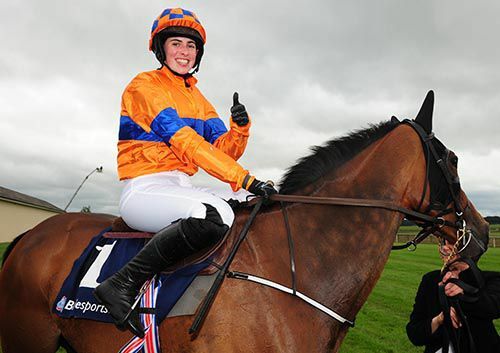 "It's a big step but she ran very well at the Curragh. She's progressing and should represent us well," said the Rosewell handler. "She's still pretty immature, I expect her to develop over the winter and I think she'll be well up to Group One level next year." John Murphy's maiden Touch Of Snow, who has yet to win in six starts, completes the septet. Mekong River made it two from two as he accounted for his two rivals in the the Irish Stallion Farms EBF Nursery. 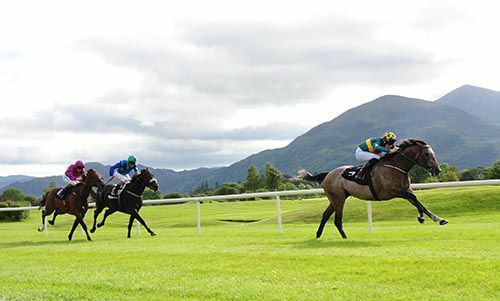 Trained by Aidan O’Brien and ridden by Joseph, the bay son of Galileo won his maiden in the Stewards room at Gowran earlier this month, after being impeded close home by Green Tag. Sent off the 4/5 favourite (1/2 over night with Paddy Power, opening at evens on-course), he was fitted with cheekpieces for the first time. He led from the start, and although Zakhm threw down a strong challenge in the straight, the ‘jolly’ pulled out more close home to score by a length and a half at the line. Zakhm finished a gallant second under Sam James for Kevin Prendergast at 4/1, while the well-backed Bleeding Hearts, 10/3 in a place this morning to 6/4 at the off, finished a disappointing last, four lengths adrift of the runner-up. Aidan O'Brien said afterwards: "He is a hardy horse and he stays well. He learned a lot from Gowran. "Joseph made the running as he felt he would get the trip well and I'd say he learned plenty again today." Our Irish Eyes column previews Sunday's top-quality card at the Curragh, featuring the Moyglare Stud Stakes. Once Ballydoyle decided to stump up €22,500 in order to supplement Tapestry for the race earlier this week, that took the total prize fund on offer to over half a million Euros and the fact that entry is free for families (defined as a minimum of one adult and one child, under-16) should ensure a decent crowd, despite it clashing with the Dublin v's Kerry game in Croke Park.The Curragh hosts the first of three consecutive weekends of Group One action this Sunday where the Group One Moyglare Stud Stakes for two-year-olds fillies' is the highlight. Last year the race was annexed by the British-trained Sky Lantern who subsequently won the QIPCO 1000 Guineas and Coronation Stakes at Royal Ascot. Britain again supplies two key players in the form of Royal Ascot heroines Kiyoshi and Rizeena, winners of the Albany and the Queen Mary Stakes respectively. 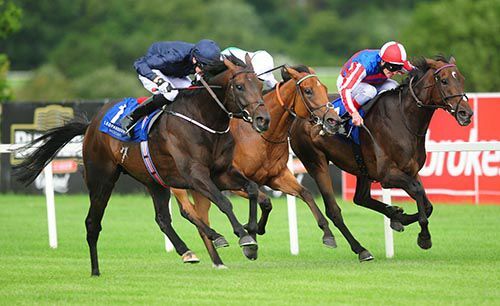 Kiyoshi was chalked up as the early favourite for the Moyglare Stud Stakes but this is a Group One that has not been particularly kind to favourite backers of late, with only two managing to land the odds over the past seven runnings. For all that Kiyoshi was very impressive in the Albany, one cannot help be reminded of another Albany Stakes winner that came into this race and was sent off at Evens favourite. On that particular occasion, the Moyglare was to prove the first of many defeats in a slippery slope for Memory, who never won again - in fact she all but refused to start in three of her four subsequent starts. Many punters were calling for Memory to spend the rest of her life as a guest of HRH The Queen and in a way, that is in fact what happened; rather than being jailed for crimes against punters however, HRH has in fact chosen to breed from 'the hamlet cigar filly' - good luck with that project Ma'am! Lillie Langtry and Listen also got turned over at odds-on in this race over the last seven years but one filly who did land the odds for Aidan O'Brien, albeit it by a mere neck when sent off at 2/7, was Rumplestiltskin. On Sunday, her unbeaten daughter Tapestry will bid to follow in her mother's hoof-prints and she is put forward as the nap selection in a competitive race that is more than worthy of its Group One status. Tapestry has impressed on both her starts here to-date, particularly when she took the Group Two Debutante over course and distance last time out. Her subsequent work at home is rumoured to have been from the very top drawer, which was borne when connections forked out the aforementioned €22,500 in order to supplement her for this race. We expect her to take this and in doing so, usurp Kiyoshi as the 1000 Guineas favourite by the evening. 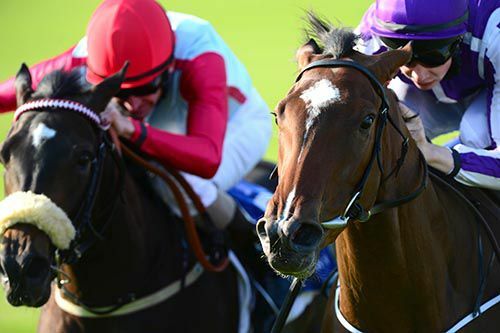 Europe’s top fillies are to contest the Moyglare Stud Stakes at the Curragh this Sunday. The home trained team will be lead by the Aidan O’Brien trained pair of Tapestry, recent winner of the Friarstown Stud Debutante Stakes and Group 3 race winner Wonderfully, while Carla Bianca, who runs in the ownership of big race sponsors Moyglare Stud, will represent trainer Dermot Weld in the Group 1 contest. Coolmore and partners invested heavily on a number of well-bred colts at the yearling sales in 2012 and one of them, War, got his first taste of black type last Saturday with a bold front-running win in the Group 3 ATC Up and Coming Stakes at Warwick Farm. The Gai Waterhouse-trained son of More Than Ready (USA) finished second on debut in the listed ATC Breeders’ Plate, but spent the remainder of his juvenile season on the bench. Resuming from his long spell at Canterbury on August 7, War turned in an indifferent run, but stripped a fitter and more focused conveyance for this 1300-metre assignment. Driven from the gates by Tommy Berry, War led throughout and kicked strongly to break his maiden with a three-quarter-length victory. Bred and offered for sale by John Singleton’s Strawberry Hill stud, War was consigned to the Inglis Easter yearling sale, where he was snapped up by James Bester Bloodstock/Demi O’Byrne on behalf of Coolmore and partners for $500,000. A three-quarter brother-in-blood to champion mare More Joyous, War is the first foal of Deedra, a minor winning half-sister by Zabeel to Group 1 winners Tuesday Joy and Sunday Joy, who is of course the dam of More Joyous. Strawberry Hill sold the second foal of Deedra, a filly by High Chaparral (Ire), for $700,000 at Easter this year. The mare has another filly to follow by War’s sire, More Than Ready, and will foal again to the same sire this spring. War is the 118th stakes winner for Vinery Stud’s champion sire More Than Ready, who stands this spring at a fee of $99,000. Piet Mondrian completed a carbon-copy double for Ballydoyle when scoring at odds-on in the three-year-old maiden at Killarney. Half an hour earlier Kingfisher had made all for a cosy victory in an extended mile contest and once again Joseph O'Brien popped out in front on the hotpot. He again had his rivals struggling in the straight and asked the Danehill Dancer colt for an effort passing the two pole. The half-brother to Aussie Rules galloped on strongly in the closing stages to record a cosy three length success over newcomer Vasanta Navaratri. The 8/11 favourite hadn't run since being beaten favourite in very testing conditions at the Curragh back in March. He had been a promising third at Leopardstown on his sole outing last year. “He did it nicely in the end and he got to dictate,” said Aidan O'Brien. “Hopefully he'll be okay in the morning as that was the problem with him. He pulled muscles off his hip. Ballydoyle colt Kingfisher justified his short price when making all for an impressive victory in the opening two-year-old maiden at Killarney. Joseph O'Brien bounced out in front on the son of Galileo and he was asked to go about his business with two furlongs to run. The 8/13 favourite pulled clear of his field before the furlong marker and went on to record a cosy nine length success over newcomer Salute Of Approval. The winner had shaped with plenty of promise when fourth behind the highly regarded Free Eagle in a Leopardstown maiden first time up. 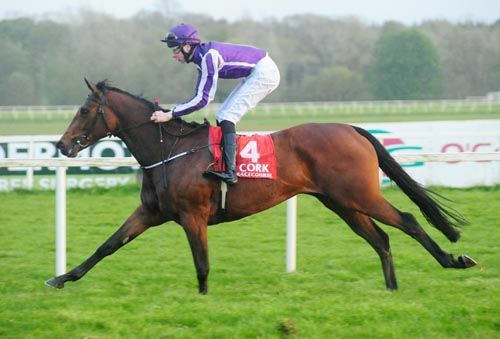 “He had a lovely first run at Leopardstown,” said Aidan O'Brien afterwards. 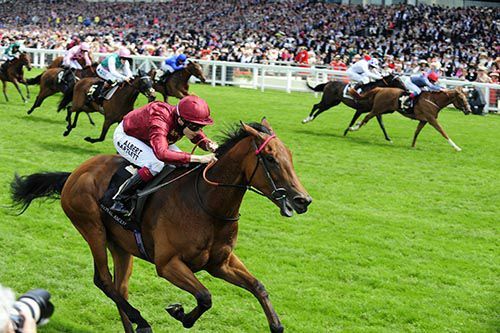 Ante-post favourite Leading Light heads the 19 possible runners still engaged in the Ladbrokes St Leger at Doncaster. There were no major surprises at the latest scratchings deadline for the final Classic of the season on September 14, while there remains one last chance to supplement a horse for £45,000 on the Monday before the race itself. 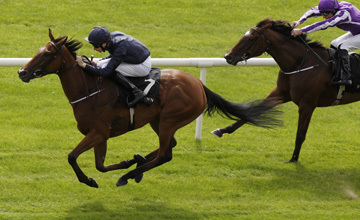 Leading Light, not seen since taking the Queen's Vase at Royal Ascot is one of four possible runners for Aidan O'Brien. He also has Great Voltigeur runner-up Foundry, Eye Of The Storm and Plinth, while a further strong Irish challenger is the David Wachman-trained Galileo Rock, placed in two Classics already. Another Irish hopeful is Dabadiyan, who completed a hat-trick of victories in Her Majesty's Plate at Down Royal on July 26. His trainer Mick Halford said: "We have left Dabidiyan in the Ladbrokes St Leger and he will also be left in the Irish St Leger. "We haven't made a decision yet, but he will have a racecourse gallop nearer the time and then we will make up our mind. "He has been coming along nicely since his win at Down Royal and I am happy with him. "He was always a big, scopey horse with loads of potential and is a smashing horse to have anything to do with. He loves good ground, has a wonderful temperament and is very straightforward. "He is not slow and has a bit of toe but when we stretch him out over longer trips there should be more improvement." John Gosden, who has captured three of the last six renewals, could saddle Gordon Stakes runner-up Excess Knowledge and Bahrain Trophy winner Feel Like Dancing. Six-times winners Godolphin can pick from Investec Derby runner-up Libertarian, Gordon Stakes winner Cap O'Rushes and Great Voltigeur third Secret Number. Investec Oaks winner Talent is also still in the mix for Ralph Beckett. 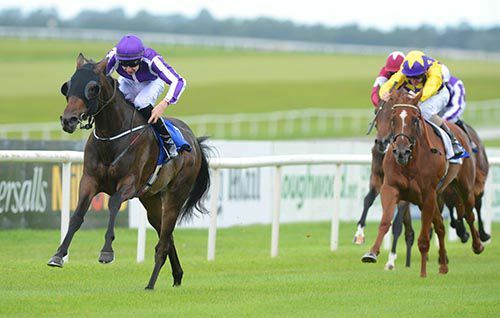 Aidan O'Brien has supplemented Tapestry for the Moyglare Stud Stakes at the Curragh on Sunday. her 100% record to two. One at a cost of €22,500. - Thirteen fillies set to do battle in the Group One Moyglare Stud Stakes at the Curragh on Sunday 1st September. The Group One Moyglare Stud Stakes takes centre stage at the Curragh next Sunday and the prestigious seven furlong fillies contest has attracted an entry of 13 including the unbeaten Tapestry which was supplemented to the race at a cost of 22,500 euro. She is one of five entries for champion trainer Aidan O’Brien who also has Bluebell, Minorette, Perhaps and Wonderfully to rely upon. Winner of a Curragh maiden on her debut here in July, Tapestry returned to Headquarters to land the Group Two Friarstown Stud Debutante Stakes earlier this month when she had both Perhaps and Minorette behind her. She certainly has the pedigree to land Sunday’s prize as a daughter of Rumplestiltskin who landed this race for the stable in 2005. Aidan O’Brien also won this race with Sequoyah (2000), Quarter Moon (2001), Necklace (2003), Misty For Me (2010) and Maybe (2013). Kiyoshi and Rizeena are the two overseas challengers. Impressive winner of the Group Three Albany Stakes at Royal Ascot, the Charlie Hills-trained Kiyoshi is likely to go off favourite on Saturday on the strength of that performance. Rizeena, meanwhile, is under the care of veteran trainer Clive Brittain, who landed this prize with Sayyedati back in 1992. Carla Bianca will carry the Moyglare Stud colours at the weekend and her trainer Dermot Weld (who won this race with Flutter Away in 1987) has also left Afternoon Sunlight in the race. Carla Bianca made a highly promising start to her career when just going under to the more experienced Australia in a maiden over this course and distance last month and her trainer has been very happy with the daughter of Dansili since then. Jim Bolger, who is targeting his fourth success in this race following the victories of Park Appeal (1984), Priory Belle (1995) and Saoirse Abu (2007), has Craic Agus Spraoi, Peony Fairy and Prudent Approach in the race. Bookmakers Paddy Power bet on the race: 13/8 Kiyoshi, 3/1 Tapestry, 5/1 Rizeena, 7/1 Wonderfully, 10/1 Carla Bianca and Perhaps, 14/1 Prudent Approach, 20/1 Peony Fairy, 25/1 Afternoon Sunlight and Minorette, 33/1 Craic Agus Spraoi and 66/1 Touch Of Snow. The highly progressive Pearl Of Africa takes another step up the ladder when she lines up for the Group Three Dance Design Stakes for which there are 16 entries, including the supplemented Frank Dunne-trained One Spirit. Winner of her last three races (all handicaps), the Eddie Lynam-trained filly will face stiff opposition with the likes of Along Came Casey and Say in the line-up, but she is reported to be “in good shape and ready to go for some black type” by her handler. Great White Eagle created a very favourable impression when landing a Naas maiden on his racecourse debut earlier in the month and the son of Elusive Quality is one of five Aidan O’Brien-trained entries for the Group Three Go And Go Round Tower Stakes. There are 12 entries in total for this contest. Stuccodor and Francis Of Assisi are among 32 entries for the Irish Stallion Farms EBF Irish Cambridgeshire in which there are a possible six overseas challengers. The first of eight races at the Curragh on Sunday, 1st September commences at 2.10pm and the ground is currently good. • Children bring your parents for free with FREE Family Admission (adult must be accompanied by a child under 16 to avail of this offer). • Adult admission is 15 euro, Seniors and under 25’s 8 euro. • Variety of free entertainment in the Moyglare Stud Children’s Zone. • Trains to Kildare Town with free shuttle bus to the Curragh Racecourse. • Dublin Coach (dublincoach.ie) provide race day service. At The Races today announced that, along with partner SIS, the Company has agreed terms for a new media rights deal with Horse Racing Ireland and the Association of Irish Racecourses that will cover the period from January 2014 to December 2016. Under the terms of the new agreement ATR will have exclusive, cross platform, non-LBO media rights worldwide to all Irish fixtures. SIS retains all domestic and international betting shop rights under the terms of its current contract with HRI. The new agreement includes significantly improved terms across multiple media rights revenue lines. At The Races forecasts that its returns to Irish racecourses will more than double in 2014 versus the returns it generates in 2013 for current rights holder SIS. Further growth is anticipated through the term of the agreement from both domestic and international services, particularly via online and new media channels. As part of the new partnership, ATR has offered HRI/AIR the opportunity to take up a seat on its board. All parties view this as a significant and important new development that will help further the effort to coordinate and align strategies and keep the Irish racing industry integrally involved in the management and direction of its rights exploitation. "We are delighted that our relationship with Horse Racing Ireland, the Association of Irish Racecourses and all twenty six tracks will be continuing next year and beyond. "Irish racing forms a significant part of our business and since 2004 an important partnership has formed to which we, our shareholders and UK racecourse partners attach considerable value. "Individually, each of the Irish racecourses has its own characteristics and requirements from us as their media partner and we work very hard to ensure that our business objectives are firmly aligned with theirs. "Collectively, the racecourses offer a consistent and high quality schedule of Flat and Jump racing across the year which our domestic and international audiences and commercial partners find increasingly attractive. "HRI and AIR made it very clear that not only did they feel ATR had done a great job monetising their rights across our current distribution platforms but that they were also excited about the long term potential of the business and we look forward to welcoming their representative onto the ATR Board as we start to roll out our growth strategy." "I am very pleased that the AIR, on behalf of all our racecourses, has now agreed terms with ATR/SIS in relation to the sale of the non-LBO rights that we recently offered to the market. "This new deal extends our long standing arrangements with both At The Races and SIS and I look forward to all parties benefiting from the partnership approach that we have always adopted in the past." TAPESTRY, favourite for the 2014 Epsom Oaks, is set to take on Royal Ascot winners Rizeena and Kiyoshi in a mouthwatering Moyglare Stud Stakes after being supplemented for €22,500 on Tuesday. The two-time Curragh winner, by Galileo, was the only horse added to the potential field for the course's Group 1 on Sunday, where she could face a fellow Aidan O'Brien-trained filly in Wonderfully, twice a winner herself but only seventh behindKiyoshi in the Albany Stakes. Rizeena, winner of Queen Mary Stakes, would line up seeking to get back to winning ways, having had her colours lowered by Lucky Kristale at Newmarket before proving no match for No Nay Never at Deauville earlier this month. Another intriguing entry on a day set to shake up the picture for next year's Classics is Jim Bolger's debutant Prudent Approach, a full sister to Dawn Approach. The form of Kiyoshi's Albany Stakes win, franked not only by Lucky Kristale but also Sandiva at Deauville, sees Charlie Hills' star filly installed as 13-8 favourite by Paddy Power, withTapestry at 3-1 and Rizeena a 5-1 chance. Prudent Approach is available to back at 14-1. Tapestry may not be the only O'Brien classic hope on show on Sunday, with Great White Eagle, a general 14-1 chance for the 2,000 Guineas, set to try to follow up his impressive debut display in the Group 3 Go And Go Round Tower Stakes. Among the entries for the Irish Stallion Farms EBF Irish Cambridgeshire is the Ed Vaughan-trianed seven-year-oldDance And Dance, in what would be a first visit to Ireland for the globe-trotting gelding, who has raced previously in America, Canada and Dubai. THE Red Mills Irish Champion Stakes or Prix Foy could be the next target for Al Kazeem according to trainer Roger Charlton, although the ground will have a major bearing on where the five-year-old lines up next. Chasing a fourth straight victory at Group 1 level, Al Kazeem finished third in the Juddmonte International at York last Wednesday, with connections of the opinion that the good to firm ground was the major reason for the defeat. Leopardstown's Irish Champion Stakes on September 7, or recognised Arc trial the Prix Foy at Longchamp were mentioned as possible targets by Charlton at Goodwood on Saturday, and he said: "He seems fine and whenever he runs we'll look for softer ground. "He might go for the Irish Champion or the Prix Foy. I'm not sure about what happens next year. I'd love him to stay in training but he has nothing to prove. There's no decision at the moment." Juddmonte International winner Declaration Of War is also under consideration for the Irish Champion Stakes, which could lead to a third meeting with Al Kazeem this season. Runner-up to Al Kazeem in the Coral-Eclipse, Aidan O'Brien's four-year-old had his revenge at York, and the trainer said: "He hasn't lost any weight so the Irish Champion Stakes is certainly a big possibility for him at this stage." However O'Brien wants quicker ground for his charge, which could scupper a potential rematch, as he added: "A lot depends on the ground and it will need to stay on the fast side for him. But he takes his races very well and I've been very happy with him over the last few days." War Command (8/11f) was a cheeky winner of the Galileo European Breeders Fund Futurity Stakes at the Curragh. 2000 Guineas. Click here to bet. The form of the Coventry Stakes at Royal Ascot had taken something of a knock since the race but its' winner managed to arrest the hoodoo in the Group 2 contest. Friendship managed to take the early lead off of Mustajeeb, and for a while it appeared as if the second string of the Aidan O'Brien team might post an upset as Seamie Heffernan kicked clear of the field with two furlongs to go. War Command was gradually eased into the race and having been asked to go about his business by Joseph O'Brien, he soon made up the necessary ground and breezed to the front for victory. O'Brien snr said: "The Ascot horse is back. "We gave him a break after Ascot and the last day he jumped and ran hard and it caught him out. In the middle of the race he was a bit ring-rusty, but when he got going he was closing to the line. "It was obviously trainer error again. I didn't have him sharp enough or tight enough. "He was a different horse today. He tipped up more like he did at Ascot and quickened up well. "I'm very happy with him and he got the seven furlongs well. "I think he was maybe asleep the last day and if we're going for the National Stakes, we wouldn't want to have him asleep again. "The boys will have a talk about it, but he'll probably come back here for the National Stakes." Sky Bet cut his price to 12/1 (from 14/1) for the 2000 Guineas. After disappointing in the Phoenix Stakes on his last start, War Command (8/11fav) bounced back to his best this afternoon, as he took the Group 2 Galileo European Breeders Fund Futurity Stakes, providing his rider Joseph O’Brien with a treble on the card. 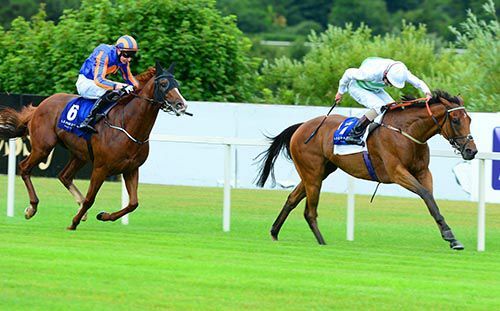 Trained by Aidan O’Brien, himself recording a double, the bay son of War Front won his maiden at Leopardstown in June and followed up in impressive fashion in the Coventry Stakes at Royal Ascot. He was well-fancied to make it three from three in the Group 1 Phoenix Stakes over the course on his last outing, but he couldn’t peg back Sudirman and Big Time there, and he had to settle for third at the odds of 2/5. His last two outings were over six furlongs, and stepped back up to seven this afternoon, he settled in fourth, as his stable companion Friendship made the early running under Seamie Heffernan. He improved into third and was niggled along two furlongs out, but he got going once asked, hitting the front under a furlong from home, staying on well in the closing stages to score comfortably by three lengths. Mustajeeb was best of the remainder under Pat Smullen for Dermot Weld at 7/2, while Exogenesis was a further head back in third under Gary Carroll for Ger Lyons. Aidan O'Brien commented in the aftermath: "The Ascot horse is back! "The last day I had given him a break after Ascot and he jumped and ran hard, and it caught him out. In the middle of the race he was a bit ring rusty. "He was a different horse today, he really quickened up. "The last day was trainer error again. I obviously didn’t have him sharp or tight enough. "I’m very happy with him and he got seven furlongs well. I wanted to bring him back here as maybe he was a bit asleep the last time. "If we are going for the National Stakes I’d rather to get a run into him over him going asleep again. "Obviously the boys will have a talk now, he will probably go for the National Stakes, but I will let them decide." Kevin Ryan's Astaire saw off the late thrusts of Wilshire Boulevard and Parbold to land the Irish Thoroughbred Marketing Gimcrack Stakes at York. The Intense Focus colt ensured the Group 2 prize went to Kevin Ryan for the second successive season following a gate to wire success. Astaire took them along from the moment the gates opened and fould plenty for pressure as the challengers mounted on wither side. Wilshire Boulevard in particular looked a major threat as he made his challenge on the stands' side under Ryan Moore, but a neck separated the duo at the line. Callan said: "Kevin seems to pick one out for the race every year - they might have to start calling it the Kevin Ryan Gimcrack! "This is a lovely horse, I can't praise him enough. He's had to do it the hard way and make his own running. 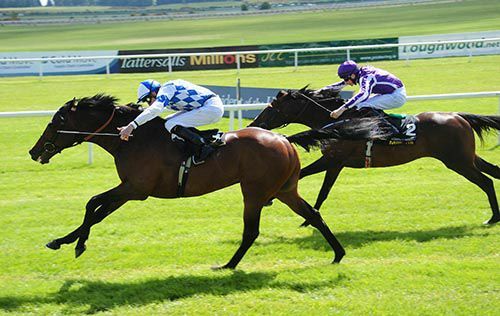 Terrific followed up on her recent maiden success, as she took the opener at the Curragh this afternoon, the Loder European Breeders Fund Fillies Race. Trained by Aidan O’Brien and ridden by Joseph, the daughter of Galileo got off the mark over the course on her last start, beating Gorteo by half a length in a maiden over a mile. Dropped back to seven furlongs today, she was easy to back on-course, drifting from an opening show of 8/13, out to her starting price of 5/4 and favourite. The on-course money came for the David Wachman trained Little Fastnet. She was backed from 11/1 to 9/2, but ultimately disappointed, coming home a poor sixth under Wayne Lordan. The winner, who cost 1.3 million Guineas at Tattersalls last October, made all the running and she was ridden clear two furlongs out, keeping on well to score by two and a quarter lengths. Witches Brew ran a nice race on her debut, keeping on well to take second at 25/1 under Seamie Heffernan for Eddie Lynam, while Peony Fairy (10/3 to 9/4 on-course) finished two and a half lengths back in third. Aidan O'Brien said afterwards: "I’m delighted. We put blinkers on her the second time and they really woke her up. We’re very happy with her. "She is a hardy filly and there is plenty in there. We will step her up now." Terrific, who is a full-sister to Group 1 victor Together, holds entries in a whole host of valuable races in the autumn, including the Group 1 Shadwell Fillies Mile at Newmarket next month. Royal Diamond, last year's Irish St Leger hero, bids to confirm his place in next month's Curragh Classic when he lines up at the Co Kildare track this afternoon. Johnny Murtagh's charge faces just four rivals in the Gain Irish St Leger Trial, but they include the Aidan O'Brien-trained Ernest Hemingway, who defeated him for a second time this season in the Ballyroan Stakes at Leopardstown. However, O'Brien warned Ernest Hemingway might not even run if the ground continues to deteriorate. 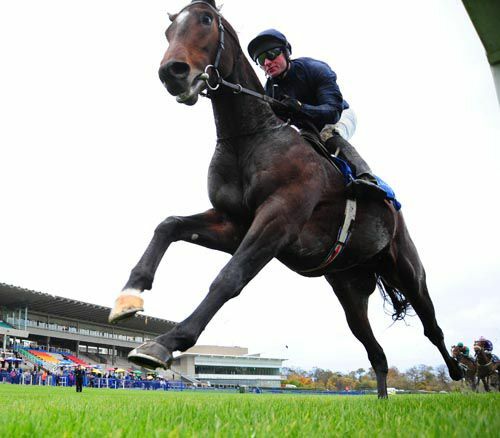 He told www.coolmore.com: "Ernest Hemingway is in good form but he is a horse who needs good or faster ground, so we don't want any more rain. "If the ground turns slow we will have to think about whether he will take his place in the line-up." Before that run, Royal Diamond had won at Foxrock by three and three-quarter lengths from Sir Ector. 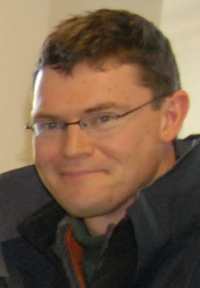 The latter is trained in Co Armagh by Jimmy Lambe, who would love to map out an adventurous plan for the six-year-old. "In reality, Royal Diamond got a freebie at Leopardstown when he was almost 20 lengths clear so to get within four lengths of him was a good run even if he was easing down," said Lambe. "It's a very competitive affair and he's got to improve a bit, but my horse has won an Ulster Derby and was third in Her Majesty's Plate (at Down Royal). He has a good pedigree and is a good servant to the yard. "If he wins the owners might supplement him for the (Irish) Leger, but his target on the Flat is the Prix du Cadran over two and a half miles on Arc day and he might go back over hurdles depending on the ground." Dermot Weld has decided to let Voleuse De Coeurs strut her stuff but she has plenty to find after finishing third behind Ernest Hemingway and Royal Diamond in the Curragh Cup at the end of June. "Voleuse De Coeurs will take her chance in the Group Three, but it looks a good field," said the local trainer. The line-up is completed by the Monica Dowdall-Blake trained Shu Lewis. She finished a respectable seventh in last year's Irish St Leger, and she was second in Her Majesty's Plate at Down Royal on her last start, a head in front of Sir Ector. Sarah O’Brien was seen to good effect onMarchese Marconi, as she partnered the son of Galileo, who is trained by her father Aidan, to win the Gorey Qualified Riders Race. Owned by Annemarie O’Brien, the bay colt was making a quick reappearance this evening, after finishing a close up fourth to Ted Veale at Bellewstown on Wednesday. Sent off a 5/2 chance, he raced mainly in fourth, before making headway to challenge approaching the straight. He hit the front under two furlongs out, and he kept on well under pressure in the final furlong to just hold off the challenge of the 4/7 favourite, Pique Sous, by a head. Aidan O'Brien said afterwards: "I was told by Sarah and Joseph that we were riding him wrong. "He was travelling well in his races but he was getting there just a bit too early, so Joseph said that he would be better held up, and Sarah agreed. "The rain probably helped him and we will keep him those races now." It was a second career success for Sarah, who recorded her first winner on Beach Of Falesa in the Laides Derby at the Curragh in June. 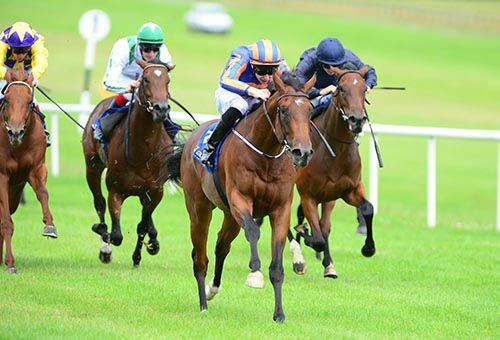 Out of luck in York this afternoon, Aidan O’Brien had plenty to smile about on home turf, as The United States brought about a treble for him and Joseph, as he took the last at Tipperary, the Follow Tipperary Races On Facebook Race. The son of Galileo won on his debut at the Curragh last July, but disappointed on his first start as a three-year-old finishing sixth of eight in the 2000 Guineas Trial at Leopardstown in April, when sent off the 7/4 favourite. Sent off the even money favourite to get back to winning ways, he made all, asserting inside the final furlong to see off the challenge of the Patrick Prendergasttrained Manalapan (13/8) by a length and three parts. 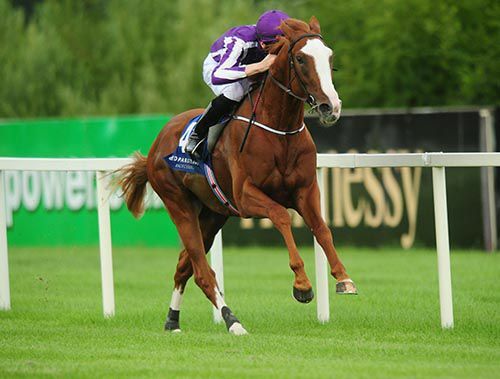 Joseph O'Brien said afterwards: "He is back on good ground which he likes. He won his maiden on good ground and then disappointed at Leopardstown. "He had a little setback after that and we gave him time. "He is still very raw and green but he did it nicely." Aidan & Joseph O'Brien had earlier scored with Orchestra and Friendship. Friendship may have taken five starts to break his maiden at Leopardstown but the Galileo colt is now on a real “upward curve” and followed up under top-weight in the Irish Stallion Farms EBF Premier Nursery. Joseph O’Brien repeated the Leopardstown tactics keeping things simple from the front, and the Ballydoyle representative had his four rivals all in trouble turning in. O’Brien turned the screw on the 9/10 favourite and kicked clear early in the straight for a convincing two and a half lengths victory. Glassatura (14/1) kept on at one pace to take the runner-up spot, with Zakhmanother two lengths adrift in third. Joseph O’Brien said, “He’s just a slow learner. He was brought to Royal Ascot on his second run and was disappointing but has just taken a couple of runs to get the hang of things. 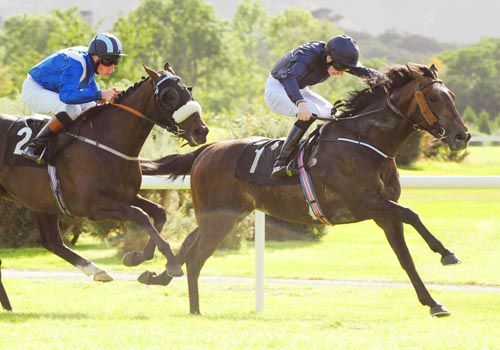 After finishing second on his debut at Leopardstown, Orchestra went one place better this evening, taking the Camas Park Stud EBF 2yo Maiden in convincing fashion. 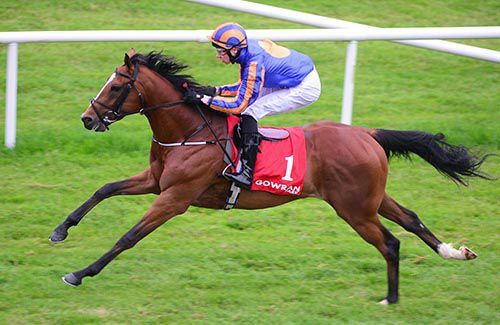 Trained by Aidan O’Brien and ridden by Joseph, the son of Galileo was no match for the exciting Free Eagle, at Leopardstown last week, going down by five and a half lengths. He was sent off the 4/11 favourite to get it right this evening, and he hit the front over a furlong out, keeping on well from there to score by two lengths. Lungarno Palace made it a one-two for Ballydoyle, the newcomer finishing second under Seamie Heffernan at 12/1, while Hurricane Volta was half a length back in third at 25/1 under Wayne Lordan for David Wachman. Joseph O’Brien said afterwards: "He is a nice big horse and the nicer ground after Leopardstown suited him." The winner holds an entry in both the Racing Post Trophy at Doncaster in October, and next year's Epsom Derby. Our Obsession stuck to her task well to take the 'Breeders Backing Racing' EBF Galtres Stakes at York this afternoon. Frankie Dettori always had the 3/1 favourite handy and was quick to react when the leaders injected some pace into the race turning for home. She hit the front a furlong from home but she had to repel the persistent challenge of the Aidan O'Brien Say, who fought tenaciously under a strong Ryan Moore drive. However, William Haggas' filly was not for passing and she battled on well to record a neck victory. Say was second at 4/1 while 18/1 shot Jathabah was a further length-and-a-quarter back in third. The Fugue produced a devastating turn of foot to put her rivals to the sword in the Darley Yorkshire Oaks at York on Thursday afternoon. Long-time leader Scintillula set a decent gallop under Kevin Manning but she gave way to her rivals at around the three furlong marker. The 9/4 second-favourite Venus De Milo took up the running with two furlongs to go but she was always a sitting duck as William Buick exuded confidence on the 2/1 market-leader. She put the race to bed in a matter of strides when Buick asked the question and she gambolled away to register a four length victory. Buick could not disguise his delight after the race. "I'm delighted for the filly as she's showed everyone what she can do," he said. "They went a good gallop up front and it's sometimes difficult to make the ground up when it's quick. She loves this ground though and is top class when it's like this." The Fugue's trainer John Gosden was notably relieved after the his filly had recorded the second Group 1 victory of her career. "It's lovely to have a nice home-bred filly like this," said Gosden. "I'm happy for her as I thought she'd get very near to the colts in the Eclipse but she was very ill afterwards and that wasn't her running. "We had to miss the Nassau as a result but it meant she was on top form for this race and it's all come right. In truth, we really should have won last year as she came to win the race but a driving thunderstorm meant the jockeys couldn't see what they were doing. "I thought she had it won but she was just nailed on the line. She's made up for it this year though." Venus De Milo plugged on to finish second while 6/1 shot Secret Gesture was back in third. Joseph O'Brien feels a race like the Breeders' Cup Classic would suit Wednesday's Juddmonte International winner Declaration Of War. The four-year-old claimed his second Group One of the season on the Knavesmire after winning the Queen Anne Stakes over a mile at Royal Ascot. He had been put in his place by Al Kazeem in the Eclipse but turned that form around with his old rival only third. Now he has conclusively proved his stamina over 10 furlongs as well as his fortitude, as the race came just 10 days after tackling Moonlight Cloud in the Jacques le Marois. "He's tough, he tries very hard and takes his racing very well. He comes out of each race better than he went into them," O'Brien told At The Races. "I thought I'd be much closer to Al Kazeem than I was in the Eclipse but whether I could quite beat him, I wasn't sure. The Eclipse was probably my fault as he nicked a couple of lengths off me and it took me half a furlong to get my lad going. "I knew I'd give him a run for his money. "We went a nice even gallop and there were no excuses, my horse galloped out to the line really well. "I suppose he can go to any big race over a mile or a mile and a quarter, he's got lots of speed, stays well and has a great constitution. "I don't think the Breeders' Cup Classic is out of the question, he jumps out well, has loads of speed to get a position and he stays." 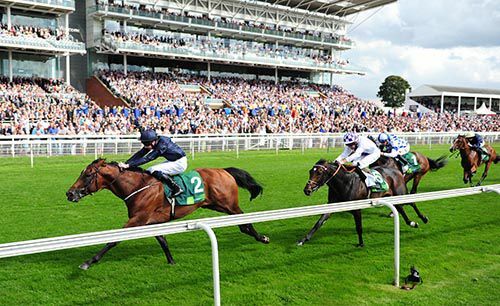 Aidan O'Brien reports Venus De Milo to be in top form as she bids for glory in the Darley Yorkshire Oaks at York. 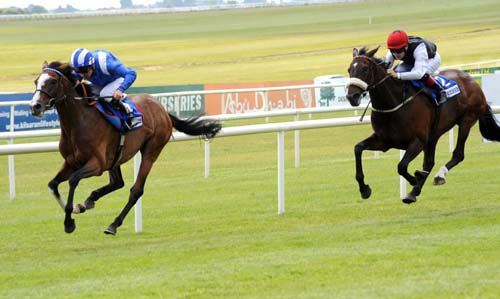 The Duke Of Marmalade filly did not run as a juvenile but made up for lost time when winning on her debut at Fairyhouse in June before following up in Listed company at Naas just two weeks later. 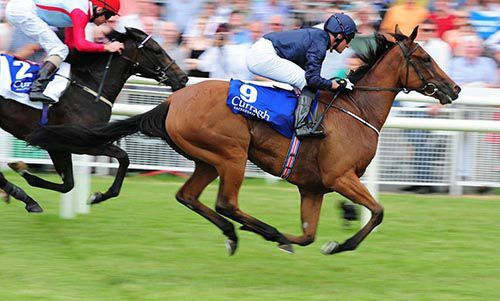 O'Brien then threw her in at the deep end for the Irish Oaks at the Curragh and while she lost her unbeaten record, she finished with a real rattle to take second place behind Chicquita. Venus De Milo returned to winning ways last time out in the Give Thanks Stakes at Cork when she made all the running, after which O'Brien suggested she would be heading to next month's Prix Vermeille in France. However, she is in such good heart those plans were revised and she takes her chance on the Knavesmire. 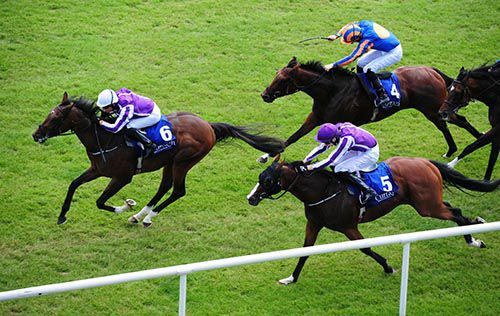 "The original plan was to give her a break and go to the Prix Vermeille," said O'Brien. "But after the Curragh she thrived and really went the right way. We kept her in full work and have been happy with her since. "She is in good form and we decided we would let her take her chance. It's a step up against the older fillies." Another three-year-old tackling her elders is the Ralph Beckett-trained Secret Gesture, who finished second in the Oaks at Epsom and the German equivalent. Beckett had the Oaks winner Talent entered originally but the likely fast ground has seen her rerouted to Doncaster for the St Leger. Earlier in the season Secret Gesture was considered in a different league to Talent and connections were disappointed she was beaten in Germany, but she now has the opportunity to prove her class closer to home. "She came out of her run in Germany better than any of us could have hoped. She had a very hard race that day," said Beckett. "Her work has been good since, she looks great and we're very much looking forward to the race on Thursday." Jamie Spencer rides Secret Gesture and is hoping the long straight at York will play to her strengths. "Hopefully the race will be run to suit and she can show that she's one of the better fillies," Spencer told At The Races. "I rode the race to beat the track (in Germany) rather than the opposition and got nailed close home, hopefully on a more conventional course I can ride a normal race on her." Lady Cecil's Wild Coco changed hands after winning her two starts last season and the lightly-raced five-year-old looked as good as ever when claiming the Lillie Langtry at Goodwood for the second successive year. Tom Queally has chosen to partner her ahead of the Ribblesdale winner Riposte, but the fast ground on the Knavesmire is giving her connections cause for concern. Taki Murayama, who represents Wild Coco's owners, K I Farm Corporation, said: "It all depends on the ground. Lady Cecil is very keen to run but if it is too firm, she may take her out. "It will be purely up to Lady Cecil, I imagine the decision will be left as late as possible as there is a chance it could rain before the race. It would be a shame as we had been looking forward to running." Queally believes she deserves the step up in class, but stressed how important the ground was to Wild Coco. "She was impressive at Goodwood. Obviously she'd been off the track a long time. She's been in good fettle since that run," said Queally. "She won in decisive fashion on that occasion and hopefully there's more to come. "We just had to wait for the ground. It can be frustrating when it's so quick at times, but we got her there on the day. "She's entitled to have a crack at races like this from now on in. I think she'll make her presence felt." Aidan O'Brien's teak-tough Declaration Of War caused a minor surprise in the Juddmonte International Stakes at York, in which Sussex Stakes winner Toronado was a distinct disappointment. Since winning the Queen Anne at Royal Ascot, Declaration Of War had finished behind Al Kazeem in the Eclipse and Toronado at Goodwood. Since then he has even been to France to contest the Prix Jacques le Marois. While Declaration Of War has not run a bad race all season, it still took a leap of faith to see him turn the form around with Al Kazeem and Toronado. But Joseph O'Brien always appeared to look the most comfortable jockey and he saw off Irish Derby winner Trading Leather by a length and a quarter at odds of 7-1. Al Kazeem, the 11-8 favourite, was third, but Toronado was in trouble a long way from home and was never a factor. 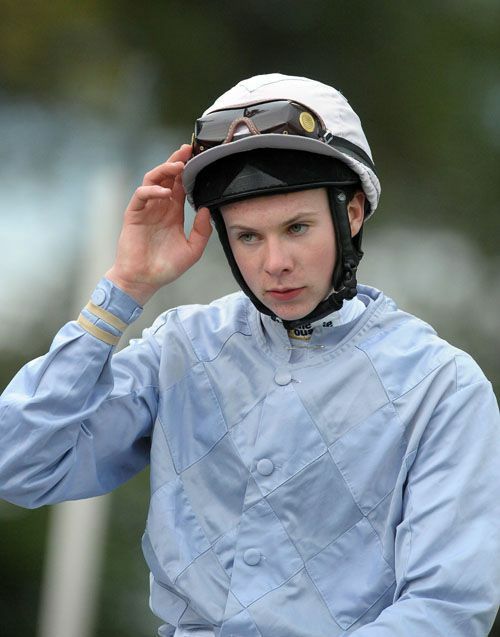 Joseph O'Brien said afterwards: "I'm not sure if it was as much of a surprise to us as it was to a lot of people. "In the Eclipse it was probably my fault. James (Doyle on Al Kazeem) got first run on me. I was only getting involved in the last 100 yards and it was all over. "This lad is tough and hardy. He's been running consistently well and a mile and a quarter on hard ground suits him lovely. "He travelled very well, relaxed great and toughed it out to the line. "We always thought you could drop him back in trip to six or seven furlongs. He was left in the Nunthorpe until the very end. "Obviously five (furlongs) would have been a bit sharp for him, but he is hardy and handles fast ground very well." Aidan O'Brien said of the winner: "He has such an unbelievable constitution, this horse, we've never had one like him. "He's had all these races but he never goes backwards. He's in full work all the time at home. "I know I said after Ascot that he'd go back in trip rather than forward, but I suppose there aren't the races for him. "He's not lost a kilo all year and he has such a physique - he has to be busy as he does himself so well. "There's a lot (of horses) going there but he could go to Leopardstown (Irish Champion Stakes) now. "He could go to the Breeders' Cup later on (for the Classic). Giant's Causeway handled the dirt, the key is to jump and travel. The lads (Coolmore) will decide, I'm sure. "To go there you need a horse that travels strong and gets a mile and a quarter." Richard Hannon jnr, the trainer's son and assistant, said of the disappointing Toronado: "He just didn't run his race. "It wouldn't have made a difference if it was over six furlongs, seven or a mile. It's very disappointing. "We'll go through him at home and at least there are two months until the big mile races, it's just a shame we didn't see what he could do at this trip." 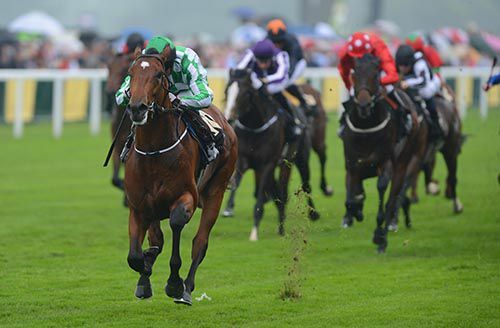 Bolger said of the runner-up: "It was an excellent run and he'll now go to Leopardstown for the Irish Champion Stakes. "He'll appreciate the uphill finish." Trainer Roger Charlton felt the ground contributed to Al Kazeem's eclipse. He said: "James (Doyle) never felt happy at any stage. He wanted to press Trading Leather more, and he couldn't do it. "He's had three runs on firm ground and he was looking after himself, I think. "You hope you can get away with it, but if you keep running a horse on firm ground when he prefers it softer, that's what happens. "Whether he goes for the Irish Champion Stakes or whatever, we'll just see how he comes back." Declaration Of War gained revenge on Al Kazeem and Toronado in the Juddmonte International Stakes at York. Beaten two lengths behind Al Kazeem in the Eclipse and three behind Toronado in the Sussex, Aidan O'Brien's tough campaigner gained revenge on his rivals with a hard fought victory in a gruelling renewal of the Group One. Irish Derby winner Trading Leather set out to ensure that the 10 furlong contest was a proper test of stamina and he had several of his rivals off the bit with over two furlongs to run.Beaten two lengths behind Al Kazeem in the Eclipse and three behind Toronado in the Sussex, Aidan O'Brien's tough campaigner gained revenge on his rivals with a hard fought victory in a gruelling renewal of the Group One. Al Kazeem appeared to be travelling strongly at that stage but he didn't appear to let himself down on the fast ground when James Doyle asked him to go and win his race and the jockey was soon sending out distress signals. In contrast, Declaration Of War and Trading Leather kept responding to every urging and it was the former who ran on best of all to prevail by a length and a quarter from his compatriot. It was a second Group One victory for the son of War Front following his success in the Queen Anne Stakes at Royal Ascot. Al Kazeem finished third but Toronado was never a factor and was allowed to come home in his own time by Richard Hughes. The winning jockey, Joseph O'Brien, said: "I'm not sure if it was as much of a surprise to us as it was to a lot of people. In the Eclipse it was probably my fault. James (Doyle on Al Kazeem) got first run on me. I was only getting involved in the last 100 yards and it was all over. "This lad is tough and hardy. He's been running consistently well and a mile and a quarter on hard ground suits him lovely. He travelled very well, relaxed great and toughed it out to the line. "We always thought you could drop him back in trip to six or seven furlongs. He was left in the Nunthorpe until the very end. Obviously five (furlongs) would have been a bit sharp for him, but he is hardy and handles fast ground very well." The result caused quite a shake-up in the betting for the Prix de l'Arc de Triomphe with Sky Bet pushing Al Kazeem out to 10/1 from 6s and cutting King George winner Novellist into sole favouritism at 4/1 while Trading Leather halved in price to 16/1 from 33s with Great Voltigeur winner Telescope a 25/s chance. 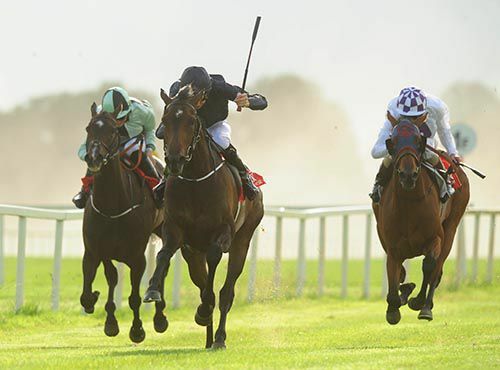 Irish Derby winner Trading Leather set out to ensure that the 10 furlong contest was a proper test of stamina and he had several of his rivals off the bit with over two furlongs to run. Aidan O'Brien said of the winner: "He has such an unbelievable constitution, this horse, we've never had one like him. He's had all these races but he never goes backwards. He's in full work all the time at home. "I know I said after Ascot that he'd go back in trip rather than forward, but I suppose there aren't the races for him. He's not lost a kilo all year and he has such a physique - he has to be busy as he does himself so well. Richard Hannon jnr, the trainer's son and assistant, said of the disappointing Toronado: "He just didn't run his race. It wouldn't have made a difference if it was over six furlongs, seven or a mile. It's very disappointing. Bolger said of the runner-up: "It was an excellent run and he'll now go to Leopardstown for the Irish Champion Stakes. He'll appreciate the uphill finish." 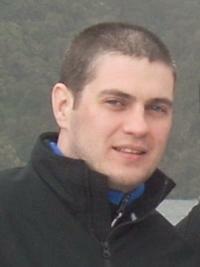 He said: "James (Doyle) never felt happy at any stage. He wanted to press Trading Leather more, and he couldn't do it. He's had three runs on firm ground and he was looking after himself, I think. "You hope you can get away with it, but if you keep running a horse on firm ground when he prefers it softer, that's what happens. 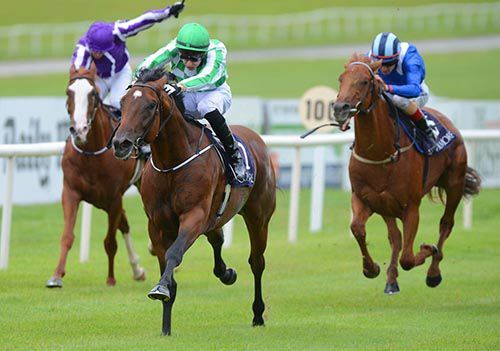 Whether he goes for the Irish Champion Stakes or whatever, we'll just see how he comes back." 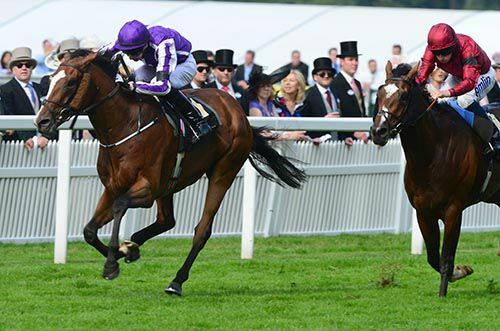 St Nicholas Abbey continues to please after fracturing a leg and recovering from colic. The prognosis had looked bleak for the six-times Group One winner when his life was threatened by colic just hours after he underwent surgery for an injury he sustained on the gallops. A month on, though, the six-year-old is reportedly making good progress, according to his owners, Coolmore. They tweeted: "It's a month today since St Nicholas Abbey underwent major surgery to repair a life-threatening fracture of his right forelimb. "The veterinary interns who are with him 24/7 described him today as the 'best he has been' and the veterinary surgeons are equally happy. "Recent radiographs look good, his temperature remains normal and his white blood cell count is good. "St Nicholas Abbey is eating well and has put on a little weight. He's comfortable and is lying down regularly to give himself every chance. "As his recovery continues we hope we can give a similarly positive update in another month." VENUS DE MILO, extremely impressive winner of a Group 3 at Cork 13 days ago and previously a fine second to Chicquita in the Irish Oaks at the Curragh, will bid to give Aidan O'Brien a third Yorkshire Oaks on Thursday. Revealing his plans for the four-day Ebor meeting, which begins on Wednesday, the Ballydoyle trainer admitted that runningVenus De Milo against the likes of older fillies and mares, such as Wild Coco, The Fugue and Emirates Queen, is something of a turnaround in thinking. 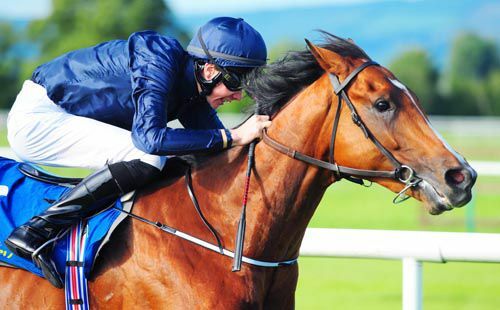 "The original plan was to give her a break and go to the Prix Vermeille," said O'Brien. "But after the Curragh she thrived and really went the right way. We kept her in full work and have been happy with her since." O'Brien, who won the Darley-sponsored Group 1 in 2006 and 2007 with Alexandrova and Peeping Fawn, added: "She is in good form and we decided we would let her take her chance. It's a step up against the older fillies." O'Brien's opening-day team comprises Declaration Of War in the Juddmonte International and Foundry in the Neptune Investment Management Great Voltigeur Stakes. Foundry was installed at 9-2 by bet365 in opening shows for the Group 2 on Monday, though Paddy Power and William Hill quoted 6-1. The Galileo colt has not been seen in action since a five-and-a-half length debut success at Leopardstown last November. 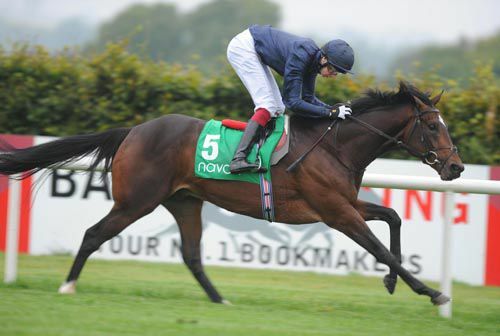 O'Brien said: "He had one run last year and won his maiden nicely. We've been happy with him, he's ready to start and we'll take it from there." Favourite for the Great Voltigeur is one-time Derby favourite Telescope, at between 6-4 and 7-4. Wednesday's Acomb Stakes was also priced up on Monday, with Paddy making The Grey Gatsby and First Flight 13-8 joint favourite, while the opening handicap, the Symphony Group Stakes, has as its market leader Ladyship at 8-1. 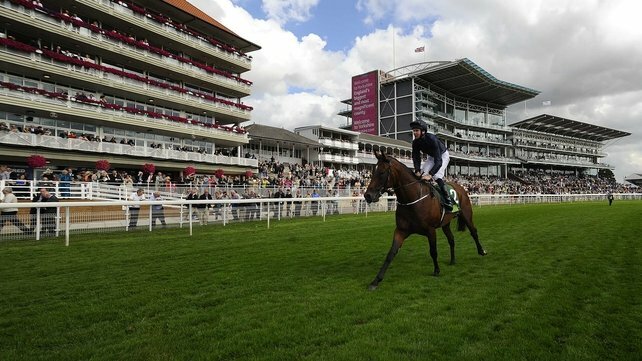 The ground at York on Monday evening was described as good, good to firm in places. The forecast is for dry, sunny spells throughout the week. Sir Michael Stoute seemingly feels Telescope has been unfairly criticised ahead of his latest appearance in the Neptune Investment Management Great Voltigeur Stakes at York on Wednesday. The one-time Derby favourite, who missed the Epsom Classic after a setback in the spring, met with defeat last time out at Haydock in the Rose of Lancaster Stakes behind Mike de Kock's four-year-old David Livingston. Having won his previous race at Leicester by 24 lengths in a fast time Telescope looked like living up to his huge reputation but Haydock was undoubtedly a step in the wrong direction. However, Stoute is hoping the move up to a mile and a half will allow the Galileo colt to maximise his potential. He told The Telegraph: "I wanted to try him over a mile and a half and this is the opportunity. He seems fine after Haydock. "It was only the colt's fourth start. I feel there has been too much yapping. He's being criticised, and that is not being fair on the horse. He's inexperienced. Let's allow his performances to do the talking." Telescope was among seven horses declared for the Group Two, headed by Cap O'Rushes, who gave recently-appointed Godolphin trainer Charlie Appleby a first Pattern-race success in the Gordon Stakes at Glorious Goodwood. Godolphin are also represented by the Saeed bin Suroor-trained Secret Number, who was two lengths back in fifth place in the Gordon Stakes. From eight entries Aidan O'Brien has singled out Foundry for participation. The son of Galileo won a Leopardstown maiden over seven furlongs by five and a half lengths on his only start last autumn. Yorkshire hopes rest with Willie The Whipper from Ann Duffield's yard. The colt was sixth to Intello in the Prix du Jockey-Club at Chantilly in early June on his latest outing. American raider No Nay Never stretched his 100% record to three with a classy performance in the Darley Prix Morny at Deauville. Wesley Ward's speedy colt flew out of the stalls and was soon in command under David Flores. The Norfolk Stakes winner, now running in the Coolmore colours of new owner John Magnier, quickly shrugged off the attentions of Muharaaj and Jallota before seeing off the late bid of Vorda. He returned at 2.2-1 on the local pari-mutuel while he was 7/4 here. The Philippe Sogorb-trained filly was also defending an unbeaten record but she was behind early on after being slowly away. She stayed on well but could not get in a blow at the impressive winner. 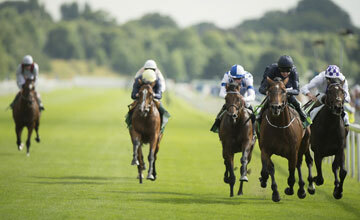 Clive Brittain's Rizeena made strong late progress to take third place just ahead of the Mick Channon-trianed Jallota. Ward said of his one-length winner: "That was great, I was so excited. The race went just as we had hoped it would. "We don't have a plan yet. We will make a plan next week sometime. "The horse will be back at home on Tuesday." Brittain felt Rizeena would have been closer but for her tardy getaway. "I was very pleased with the run. She would have been closer to the winner if she hadn't missed the break," said the veteran Newmarket handler. 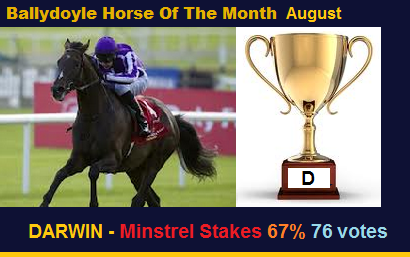 "She stayed on very strong and hopefully the Moyglare could be on the cards for her next race. If it had been seven furlongs today she would have been done and dusted. "She was out of the race early as she lost the advantage of the one draw. Then the jockey had to be patient with her, but she finished so strong. "With a break from the one draw we would have been in the shadow of the winner." for €1,000,000 at Arqana sale today. The Norfolk Stakes winner, now running in the Coolmore colours of new owner John Magnier, quickly shrugged off the attentions of Muharaaj and Jallota before seeing off the late bid of Vorda. He returned at 2.2-1 on the local pari-mutuel and 7/4 with British bookmakers.Wesley Ward's speedy colt flew out of the stalls and was soon in command under David Flores. Kingsbarns is an intriguing name among eight Aidan O'Brien-trained contenders in the Neptune Investment Management Great Voltigeur Stakes at York on Wednesday. Last year's Racing Post Trophy winner, who still holds an entry in the Juddmonte International on the same day, has yet to race this season after suffering a setback when being prepared for a Classic challenge in the spring. O'Brien had planned to work him after racing at the Curragh last Sunday but the quick ground there forced the Ballydoyle trainer to rethink that plan, although he reported the colt in fine form and progressing well. The Coolmore team have a wealth of talent at their disposal, with Queen's Vase winner Leading Light another in the running for this St Leger trial. Foundry, Sir Walter Scott and Hall Of Mirrors have also yet to run this term, while Fortify, Kingdom and Plinth are the other O'Brien confirmations. One-time Derby favourite Telescope is in the field, as expected, with Sir Michael Stoute seeking quick compensation following the colt's eclipse in the Rose of Lancaster Stakes at Haydock last week. Cap O'Rushes won the Gordon Stakes at Goodwood for Godolphin and he is one of two possibles for the owners, along with Secret Number, who finished a close-up fifth in that race. The pair are trained by Charlie Appleby and Saeed bin Suroor respectively. The Gordon third Spillway could try his luck again for Eve Johnson Houghton, while Mutashaded, Nichols Canyon, Royal Skies and Willie The Whipper round out the list of 16 possibles. Roger Varian's Mutashaded will gallop over the next couple of days before his participation is confirmed. Lightly-raced, he was last seen finishing third behind Hillstar in the King Edward VII Stakes at Royal Ascot on just his third start. Owner Hamdan Al Maktoum's racing manager Angus Gold said: "The Great Voltigeur has always been the plan. "Roger will just check his well-being this weekend before committing him to the race. "He's had one or two disappoint a little of late so he just wants to make sure. "He'll probably work on Friday or Saturday and then make a decision. "Roger also has Elkaayed who ran in the Gordon Stakes so he'd have a bit of a line through him. "This looks the right race and he has been in good form since Ascot." Al Kazeem will face a maximum of eight rivals in Wednesday's Juddmonte International Stakes at York. The five-year-old has been one of the success stories of the season with wins in the Tattersalls Gold Cup, Prince Of Wales's Stakes and Eclipse and he will aim to add another Group One to his growing list of achievements. Aidan O'Brien has a host of top-class options, including last year's dual Derby winner Camelot, who has finished behind Al Kazeem twice already this season. The Ballydoyle handler also has the option of running Queen Anne winner Declaration Of War, Epsom Derby hero Ruler Of The World and one of last year's leading juveniles Kingsbarns, although he is also entered in the Neptune Investment Management Great Voltigeur Stakes on the same day and is yet to run this term. Jim Bolger's Irish Derby winner Trading Leather and Sir Michael Stoute's Royal Ascot winner Hillstar are other three-year-olds engaged while James Toller's Rewarded is the final contender. Richard Hannon has left in Sussex Stakes winner Toronado, who would be stepping up to 10 furlongs for the first time if he is allowed to take his chance. As expected, French runner Cirrus Des Aigles will not be making the journey over following his defeat last weekend. Al Kazeem's trainer, Roger Charlton, revealed that his stable star is no certainty to run in the Prix de l'Arc de Triomphe and that he could run in the Champion Stakes at Ascot instead. "I think it's not definite that he's going to go for the Arc," said Charlton. "We'll just keep all the options open. I don't think he [John Deer, owner] wants to commit to any particular race at this stage. I suppose, in theory, if you had to choose one race where he has the better chance, you'd say he's got a better chance in the Champion Stakes." The Arc is worth £2m to the winner, about three times as much as the Champion Stakes, but Charlton said that is unlikely to be a factor in the final decision. "If he didn't have a gut-wrenching race at York, the Irish Champion Stakes could be on the agenda, followed by a choice between Paris and Ascot." "He's had a nice break and he's favourite for a hugely valuable race over a distance that he's been winning over. There's a chance that the ground might have a bit more cut in it than he's been used to recently, which will be to his advantage." Asked whether this would be Al Kazeem's final year on the track before a stud career, Charlton said that his owner would decide but added: "I suppose it's looking more like that. He hasn't got a lot to prove. And what do you do next year, run in the same races? Run the risk of something going wrong? "To prove he stays a mile and a half is not really an advantage because we know he does. So that doesn't leave anything much. It's all about whether the owner says, I'm getting more fun out of having a wonderful racehorse, or whether he says the obvious thing to do is retire him." O'Brien had planned to work him after racing at the Curragh last Sunday but the quick ground there forced the Ballydoyle handler to rethink that plan, although he reported the colt in fine form and progressing well. The Coolmore team have a wealth of talent at their disposal, with Queen's Vase winner Leading Light another in the running for this St Leger trial. Foundry, Sir Walter Scott and Hall Of Mirrors have also yet to run this term, while Fortify, Kingdom and Plinth are the other O'Brien confirmations. One-time Derby favourite Telescope is in the field, as expected, with Michael Stoute seeking quick compensation following the colt's eclipse in the Rose of Lancaster Stakes at Haydock last week. Green Tag made every yard of the seven furlong juvenile maiden to serve up a 33/1 shock in the opener at Gowran Park, but he subsequently lost the race in the stewards room. This is a race that Aidan O’Brien has won in six of the last eight years with the likes of Battle Of Marengo, Daddy Long Legs and Irish Derby winners Treasure Beach and Frozen Fire. It was therefore no surprise that his Mekong River went off the red-hot 4/9 favourite on debut, especially when main rival Intensified was ruled out through stiffness. Fergal Lynch bounced Green Tag out from the stalls into the lead and the gelding led Mekong River (who was unbalanced several times) as they raced inside the furlong pole. However, Green Tag veered sharply left causing Joseph O’Brien to stop riding on Mekong River. The favourite finished well from there though and was a neck down on Green Tagat the line. There was a lengthy stewards enquiry after which the placings were reversed. Asknotwhat at 14/1 under Pat Smullen was bang in contention at the business end. He suffered slight interference in coming home third. Indian Maharaja heads Aidan O'Brien's battalion of entries for the Racing Post Trophy at Doncaster on October 26. The Ballydoyle trainer has won three of the last five renewals with Kingsbarns, Camelot and St Nicholas Abbey all featuring on the roll of honour. Indian Maharaja moved to the head of the market for next year's Investec Derby after winning a Listed event at Tipperary last week and is one of 22 entries for O'Brien, with beaten Phoenix Stakes favourite War Command, Australia and Great White Eagle other notable names. The John Gosden-trained Kingman, the current 2000 Guineas favourite, attracted plenty of attention when winning on his debut at Newmarket and is an eyecatching entry along with Peter Chapple-Hyam's Hydrogen, an as-yet unraced half-brother to 2006 Racing Post Trophy winner and eventual Derby victor Authorized. Paul Cole's impressive Chesham Stakes winner Berkshire is also among the entries along with Godolphin's Sweet Solera-winning filly Ihtimal. Michael Tabor bought the share in No Nay Never will run Prix Morny this weekend in Tabor silks. Mars, who finished third in the St James's Palace Stakes at Royal Ascot, is to leave Aidan O'Brien and join Mike de Kock. A syndicate including Bernard Cantor, who owns horses with William Haggas, has acquired a majority share in the three-year-old but the Coolmore triumvirate of John Magnier, Michael Tabor and Derrick Smith will retain a interest in the Galileo colt. As well as running well at Ascot, Mars finished sixth in both the 2000 Guineas and the Derby and finished fourth in the Eclipse but was disappointingly beaten at odds-on in the Meld Stakes by Scintillula. South African De Kock has fared well with horses who have joined from O'Brien with the likes of Archipenko, Eagle Mountain and most recently David Livingston all winning decent races. "From what I've seen this is a serious racehorse and I can't wait to train him," said De Kock on www.mikedekockracing.com. "This is a wonderful opportunity to compete at the highest level with a top horse and my thanks go to Coolmore and the syndicate." Mars will join De Kock's small string based in Newmarket in the coming weeks. A syndicate comprising Mary Slack, Bernard Kantor and Larry Nestadt has acquired the majority share in top three-year-old Mars from Coolmore Stud in Ireland, who will retain a share in the former Aiden O’Brien-trained colt. He will be joining Mike de Kock’s stables at Newmarket, UK. Mars, by Galileo from Massarra (Danehill), has raced six times for one win over 1400m, but his other runs include several eye-catching performances at top level. Mars was a fast-finishing sixth in the Gr1 Investec Derby over 2400m, beaten only 3.75-lengths by Ruler Of The World after entering the straight last and being baulked for a run twice. Dropped in distance to 1600m, he ran on well again for third to Dawn Approach and Toronado in the Gr1 St James’ Palace Stakes at Ascot, beaten 2.75-lengths. Following that, he was also placed in the Gr1 Coral-Eclipse Stakes over 2000m and the Gr3 Meld Meld Stakes over 1800m. Mars will spend a few more weeks resting in Ireland before being transferred to Mary Slack’s Abbington Place at Newmarket, where Mike’s UK runners are based and trained from. One-time Derby favourite Kingsbarns missed an intended gallop after racing at the Curragh due to drying ground. Aidan O'Brien had hoped to work the unbeaten colt, who has not run since winning the Racing Post Trophy at Doncaster in October after an early-season setback meant he had to miss the 2000 Guineas and then Epsom. Kingsbarns' only other start came in winning a Navan maiden, a couple of weeks before his impressive Doncaster performance. 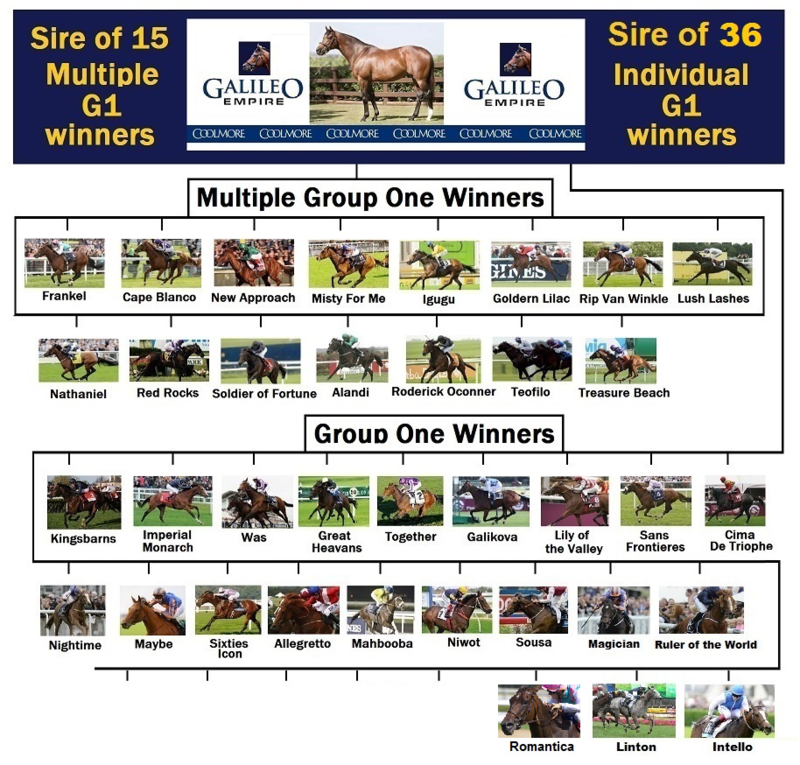 The son of Galileo still holds a number of big-race entries during the remainder of the campaign. Terrific, who cost 1,300,000 Guineas at Tattersalls last October, got off the mark on the second time of asking, as she took the opener at the Curragh, the Irish Stallion Farms EBF Fillies Maiden, for Joseph and Aidan O’Brien. The bay daughter of Galileo finished twelfth of sixteen on her debut over the course on Derby weekend, over twelve lengths behind the winner Avenue Gabriel. Her initial effort came over seven furlongs, and upped in trip to a mile, and fitted with blinkers for the first time, she went off the well-supported 9/4 second favourite (4/1 this morning and opened at 7/2 on-course). The full-sister to Together (won a Group 1 in America for O’Brien), made virtually all today, kicking for home two furlongs out, and staying on well inside the final furlong to see off the challenge of the 2/1 favourite, Gorteo and Johnny Murtagh, by half a length. Afternoon Delight (11/2) ran a nice race on her debut, completing the placings five lengths back under Pat Smullen for Dermot Weld. Aidan O’Brien said afterwards: "She was very green on her debut, that’s why she wore blinkers today. "She was unusually green, and she tried to stop in the middle of the race, she must have spooked at something. "The blinkers helped her concentrate today. "She is well-bred and we’ve always liked her. She is smart filly and she could be anything." War Command will aim to back up the huge impression he created in the Coventry Stakes at Royal Ascot in Sunday's Keeneland Phoenix Stakes at the Curragh. The Aidan O'Brien-trained colt bolted up by six lengths, just 11 days after making a winning debut. He has been given a mid-season break to recover from those exertions and will aim to give O'Brien an unbelievable 13th win in the race since just 1998. "He's in good form. I couldn't have been happier when he won at Leopardstown on his debut," said his jockey Joseph O'Brien, who overlooked War Command to ride Stubbs in the Coventry. "We were hoping he'd run well at Royal Ascot, but he bolted up. He's a lazy worker but he has a good attitude and he never kills himself at home. "You can take notice of how a race works out but it's more important to have your own horse in good form. "He's had a little break and has strengthened up. He'd have no problem with six or seven furlongs and we'd be hoping for a good run on Sunday." O'Brien will also runs Wilshire Boulevard, winner of the Anglesey Stakes last time out. The sole challenger from England is Mick Channon's Ambiance, fourth in the Norfolk Stakes at Ascot and a close third in the Molecomb at Goodwood. "I thought he ran really well at Goodwood," said Ted Voute, owner Prince Faisal's racing advisor. "He's so laid-back that when he hit the front it was like he was in a gallop at home. "Maybe that's as good as he is, I don't know, but the two-year-old form has been a bit all over the place this season and he deserves a go in a race like this." John Murphy supplemented the promising Big Time after he finished second to Sudirman in the Railway Stakes. "We're looking forward to it. The horse is in the form of his life," said Murphy. "It was either this or the Prix Morny. We decided to come here as it's on our doorstep and he's quite a big horse, so we decided it might be better not to travel. "I think he's improved since his last run, but I'm sure the other trainers are thinking the same. "Aidan's horse looked the real deal in Ascot, so we'll see what happens. "We'll know a lot more on Sunday night, that's for sure. "This could be our horse's last run of the year, or he could go for the National Stakes afterwards." David Wachman's Sudirman and Big Time meet again with the former's jockey, Wayne Lordan, looking forward to the challenge. "He won quite well when he won the Group Two and he's a progressive horse who'd come on well from his maiden," Lordan told At The Races. "He's in good order. It's a hard race to win but we're going into it with a nice horse with a chance. "War Command stands out, he was very impressive at Ascot but we're happy with out horse so we'll go and have a go. "He's had a nice break, he's a big horse but he came out of it well. "He can race a bit lazy but you know when you get stuck into him there's a lot under the bonnet so hopefully he can prove that again." Sniper, the Ger Lyons-trained maiden, completes the six-runner field. Multiple Group One-winning mare Sea Siren and July Cup third Slade Power face off in an intriguing battle for the Paypal Supporting Irish Autism Action Phoenix Sprint Stakes at the Curragh on Sunday. 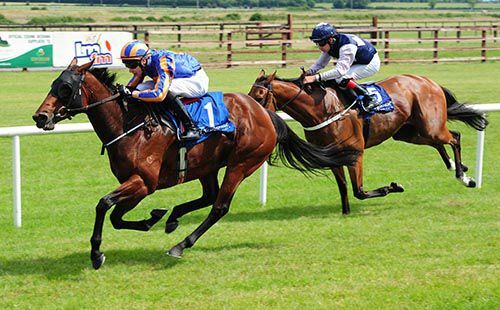 Sea Siren struck three times at the highest level when trained by John O'Shea in Australia and made a pleasing debut for Aidan O'Brien's stable when landing the Listed Belgrave Stakes at Fairyhouse a month ago. The Eddie Lynam-trained Slade Power is a significant threat in this six-furlong Group Three, however, having progressed with each start this season, most recently running a blinder behind Lethal Force at Newmarket. Lynam said: "We have to give Sea Siren six pounds and she is a very good mare, but my fellow is in good form and I'm very happy with him." Ken Condon is anticipating a bold show from In Salutem, runner-up in a conditions race at Naas last week. Condon said: "He should have a better record than he has. He has only one win to his name but he probably should have three. He flatters to deceive at times. "He has always done nice homework but hasn't really translated it on to the racecourse. I know he is going to be an outsider on Sunday but I think putting in him a better race might see him in a better light." David Marnane has declared Dandy Boy and Red Dubawi, but is set to rely on the former as Red Dubawi ran at Tipperary on Friday evening. Dandy Boy makes his first start since finishing down the field in the Diamond Jubilee Stakes at Royal Ascot. Marnane said: "He's had a break since Ascot and he will appreciate the ground and the trip. It is a hot race but I'm hoping for a good solid run from him." Mick Halford plans to make a late call on the participation of Russian Soul, who enjoyed a deserved victory in the same Tipperary contest in which Red Dubawi finished eighth on Friday. Andrew Oliver's Sendmylovetorose looks to build on a promising comeback run at Galway, while Michael Dods and sends Mass Rally across from the UK. 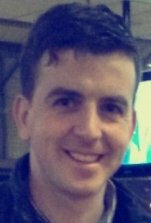 Hamza is another UK raider making the trip across from the Kevin Ryan yard, while after winning at Tipperary on Friday, An Saighdiur completes the line-up, however he is unlikely to take part. Indian Maharaja made it two from two as he took the Listed Coolmore Canford Cliff Stakes in convincing fashion. The Aidan O’Brien trained colt was sent off the 3/10 favourite, after he impressively won his maiden at Gowran last month by six and a half lengths. The regally-bred son of Galileo, settled behind the leaders in fourth, and was ridden to close a furlong and a half from home. He hit the front a furlong out, asserting soon after, going on to score comfortably by three lengths. Jim Bolger’s newcomer Ceisteach opened on-course at 33/1 but was well supported trackside and went off just 14’s. The daughter of New Approach kept on well closing stages to take second, getting each-way money for her supporters. Captain’s Affair and Boom The Groom were sent off the second and third choice of punters, but they both disappointing finishing in fifth and last respectively. Joseph O'Brien said afterwards: "He'll learn plenty from that, he's still very green. "He's a lovely horse, he relaxed and quickened up well. "I couldn't be any happier with him. I gave him a little slap and he quickened up well. "He's an exciting horse. He won over a mile the first day and seven today - he has plenty of pace and he relaxes and stays." Ernest Hemingway put in a tough performance to just edge out both Royal Diamondand Scintillula in the Group 3 Ballyroan Stakes. Providing Aidan & Joseph O’Brien with a double on the card (took the second withFriendship), the four-year-old son of Galileo was sent off the 11/8 favourite. Used as a pacemaker in the past, the bay colt sprang to prominence on his last start, as he stayed on strongly in the closing stages to win the Group 3 Curragh Cup, beating Royal Diamond by five lengths. That race was over a mile and six, and dropping back to a mile and a half this evening, he was settled in rear. He moved into a closer third at the halfway stage and he was ridden entering the straight. Royal Diamond attempted to make all under Johnny Murtagh, but he was challenged by the winner on the outside and Scintillula in the middle a furlong from home. Ernst Hemingway got on top 100 yards out, and he kept on best from there to score by half a length. Royal Diamond took the runner-up spot at 9/4, Scintillula (2/1) was a further half a length back in third under Kevin Manning for Jim Bolger, while St Jean finished last of the four, just three and a quarter lengths back under Chris Hayes for Kevin Prendergast. Joseph O'Brien said afterwards: "He relaxed really well but he idled like mad going to the line. "He is a horse that is progressing and the Irish Leger fits into his programme well." Friendship got off the mark on the fifth time of asking as he eased to victory in the Irish Stallion Farms EBF 2yo Maiden. Ridden by Joseph O’Brien, and trained by his father Aidan, the white-faced son of Galileo broke well and made all, asserting over a furlong out, and staying on strongly from there to score easily by six lengths. Bogardus put in a satisfactory effort on his debut to take second at 16/1 underDeclan McDonogh for Patrick Prendergast, while another newcomer, Sinndar Desert(16/1), was four and a quarter lengths back in third under Chris Hayes for Paul Deegan. The winner, who holds a whole host of big race entries, was sent off the 3/10 favourite, with his price shortening considerable this morning when Corona Borealis was taken out. Joseph O’Brien said afterwards: "Fast ground is his thing and he bounced off of it this evening. The ground was plenty slow in Galway for him. Colm O'Donoghue is in line to return to action at the Curragh on Sunday having been on the sidelines since fracturing his collarbone at Limerick in June. O'Donoghue, who is preparing for a six-month stint in Hong Kong, sustained the injury after being unseated from Diamond Lucy when the filly clipped the heels of another runner in the Irish Stallion Farms EBF MaideHe said: "I've been back riding out since last Monday, the injury has healed up well and Dr Adrian McGoldrick and his brother, surgeon Fergal, have been brilliant to me. "I'm hoping to get a few rides at the Curragh, but I'm heading out to Hong Kong next week for six months so my focus is on that. "The Hong Kong Jockey Club issues licences for six months and Mick Kinane was the last Irish jockey to be issued one. Three of us have been issued licences, the other jockeys are from South African and Italy. "Hopefully things will work out well over there." Kingsbarns will not run in the Bet Online At thetote.com Royal Whip Stakes at the Curragh on Sunday. Aidan O'Brien's colt, who has not been seen in competitive action since winning the Racing Post Trophy at Doncaster last October, will instead have a racecourse gallop after racing at the Co Kildare circuit. The decision was made not to run Kingsbarns in the Royal Whip after he was put through his paces on the gallops on Wednesday morning. O'Brien said: "We're conscious of where he's coming from (having been off the track for so long). "He's made great progress over the last few weeks, but, at this stage, we'd prefer to work him after racing on Sunday rather than race him." 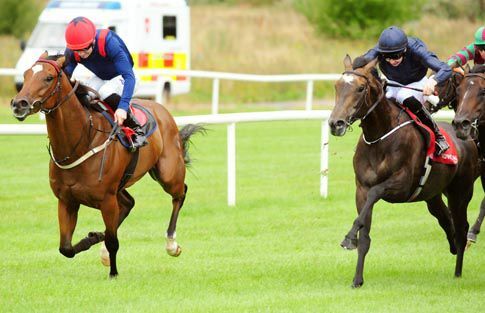 O'Brien will instead rely upon Fortify, who was sixth in a handicap at Galway last week. The trainer said: "He worked well and he'll be our runner in the race." War Command and Ambiance have been given the go-ahead to compete in the Keeneland Phoenix Stakes at the Curragh on Sunday. The unbeaten former won the Coventry Stakes at Royal Ascot by six lengths in June and is now set to step into Group One company. 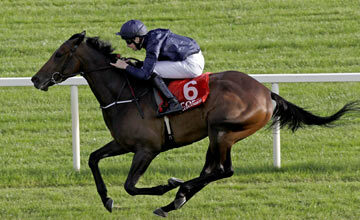 Trainer Aidan O'Brien said: "War Command worked well this morning and will definitely take his place in the Phoenix. "There's also the possibility that we'll run Fountain Of Youth and Wilshire Boulevard." 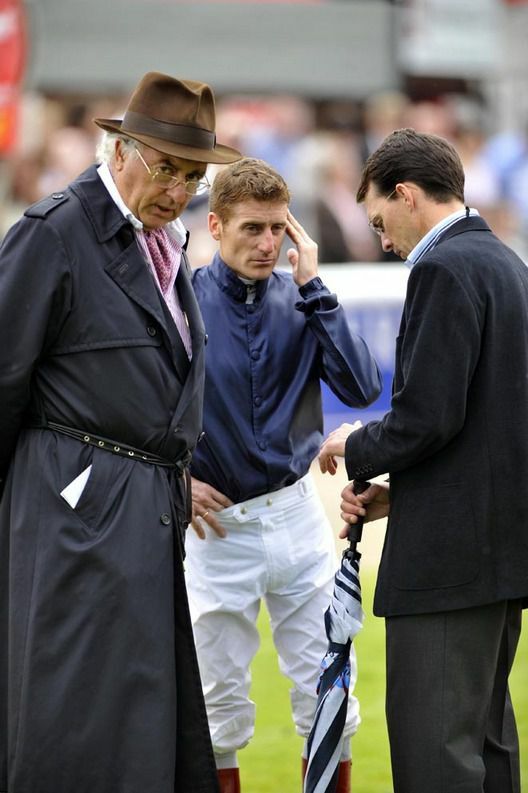 Johnny Murtagh, meanwhile, will partner Ambiance in Sunday's contest. Murtagh, who has been in inspired form this summer, will receive the leg-up aboard Mick Channon's colt for the first time as regular jockey Martin Harley is in action at Windsor on the same day. Ted Voute, racing and bloodstock manager for his owner Prince Faisal, said: "Ambiance runs at the weekend and is in very good form. Martin is busy at Windsor so we've got Johnny Murtagh on board, which is never a bad thing - especially on home turf." Ambiance has been highly tried this summer, with a Listed win at Sandown and a solid fourth in the Norfolk Stakes at Royal Ascot the highlights. He was last seen finishing a close-up third in the Molecomb Stakes at Glorious Goodwood. 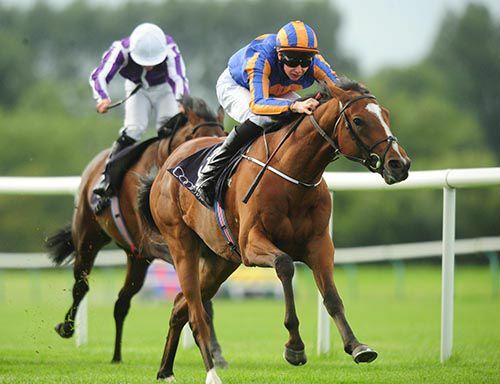 Trainer Aidan O'Brien is likely to be triple-handed in the Friarstown Stud Debutante Stakes at the Curragh on Sunday. The Ballydoyle handler has whittled down his options for the informative Group Two over seven furlongs to Minorette, Perhaps and Tapestry. Minorette looked impressive on her sole start, when victorious at Naas in July, whereas Perhaps boast the stronger form, having got to within a length of stablemate Wonderfully in a Group Three at Leopardstown. Tapestry is also unbeaten from one outing, when she beat Chroussa by half a length over six furlongs at the Curragh last month. O'Brien said: "In the Debutante we intend to have three runners - Minorette, Perhaps and Tapestry. They all worked this morning and worked well." VENUS DE MILO looks set to bypass the Yorkshire Oaks and will instead go for the Prix Vermeille as the Irish Oaks runner-up made it three wins from four starts with a comfortable win. The daughter of Duke Of Marmalade was sent off the 1-4 favourite to bounce back to winning ways after her troublesome path in the Irish Oaks last time and it was basically a case of the further she went the further clear of her pursuers she stretched. Joseph O'Brien put up 1lb overweight on Venus De Milo but that mattered not a jot as she made virtually all the running under him before scooting clear in the final furlong to win by three-and-a-half-lengths from Bunairgead. With none of her rivals keen to go on, O'Brien decided to take it up early on board the favourite and she bowled along seemingly happily at the head of affairs. Although late on she did show a sign of greeness, Venus De Milo's backers never really had anything to worry about as she was in a different class to her rivals. Winning trainer Aidan O'Brien said: "She's an improving filly and this was an important race for her. Joseph said that making the running wasn't ideal as she was doing plenty in front. But at the same time, you never know when these sort of races can get messy." Venus De Milo has an entry in the Darley Yorkshire Oaks later in the month but her trainer suggested she was unlikely to head there. "She might mature into a really nice mare as she's big and strong," he continued. "She's come a long way in a short space of time. The plan was to come here for this and then go for the Prix Vermeille at Longchamp so that's the way we'll go with her now. I've been thrilled with her since the Irish Oaks." Venus De Milo is the second beaten horse to come out of the Irish Oaks and win a Group race after Scintillula, fourth home in that race, subsequently claimed the notable scalp of Mars. Aidan O'Brien's Irish Oaks runner-up Venus De Milo booked her Prix Vermeille ticket with an easy win in Cork's most valuable Flat race, the Irish Stallion Farms EBF Give Thanks Stakes, today. 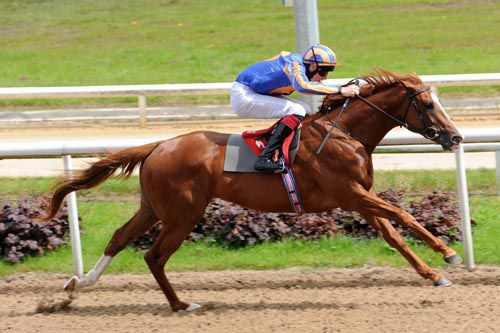 Ridden by the trainer's son and Champion Jockey Joseph O'Brien (carrying one pound over-weight at 8st13lbs) the daughter of Duke Of Marmalade made all and stayed on strongly in the straight for a three and a half lengths win over Bunairgead. Aidan O'Brien Senior stated “it was lovely to come here for this and the track is in super order. It's an important race for her to win and while it wasn't ideal being in front, you never know what can happen in these type of races if things get messy. Aidan O'Brien is delighted with Coventry Stakes winner War Command ahead of Sunday's Keeneland Phoenix Stakes at the Curragh. He heads the field for the six-furlong Group One and looked an immense prospect after his stunning victory at Royal Ascot. O'Brien has won the race 12 times through the likes of George Washington, Holy Roman Emperor and Mastercraftsman as well as last year with Pedro The Great. He has half of the 10-strong field, with War Command joined by Fountain Of Youth, the unraced Giovanni Boldini, Wilshire Boulevard and Bluebell. War Command has been confirmed a runner, but only Wilshire Boulevard, who collected the Anglesey Stakes over the course and distance a fortnight ago, was mentioned to join him in the Ballydoyle squad. "War Command has been in great form since Royal Ascot and we are really looking forward to running him on Sunday," said O'Brien. "We will wait until later in the week as regards the other horses, but Wilshire Boulevard is also up for consideration for the race." Kingsbarns, one of last season's leading juveniles, could make his long-awaited reappearance in the Bet Online thetote.com Royal Whip Stakes at the Curragh on Sunday. The Aidan O'Brien-trained Galileo colt won the Racing Post Trophy last season on just his second start, only 17 days after making a winning debut. Unfortunately, he picked up an injury when being prepared for the 2000 Guineas and is only now ready to return. He is unlikely to have it all his own way, however, as Mark Johnston has entered the progressive Maputo. 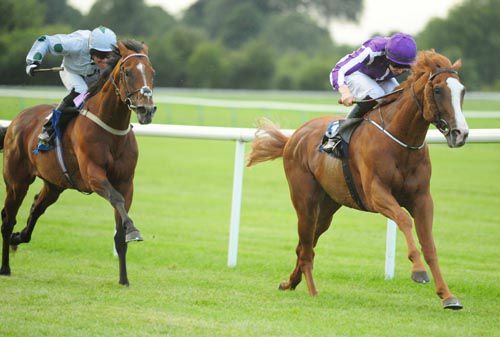 Another high-class entry is Jim Bolger's filly Scintillula, who turned over O'Brien's Mars last time out. Caponata, Bible Belt, Uleavemebreathless, Fortify and Qewy make up the remaining possibles. Kingsbarns' participation hinges on a piece of work at Ballydoyle tomorrow morning. O'Brien said: "We will work the horse in the morning and make a final decision after that. "Fortify also holds an entry in the race and it will be a similar situation with him." trained Galileo colt won the Racing Post Trophy last season on just his second start, only 17 days after making a winning debut. Great White Eagle put in an impressive display to score on his debut in the opener at Naas this afternoon, the Michael T O’Maille Race. The Aidan O’Brien trained son of Elusive Quality was 3/1 this morning with Paddy Power, opening on-course at 5/2, touching 7/4, before going off the 2/1 second favourite. Given a patient ride by Joseph O’Brien, the bay colt cruised into the lead a furlong out, keeping on well from there to record a comfortable two and three parts of a length success. Recent course and distance winner Gold Peregrine was sent off the 11/10 favourite for rider/trainer Johnny Murtagh. He was under pressure a fair way out, but he did keep on close home to take second, while Remember You was a short head back in third under Wayne Lordanfor David Wachman at 9/1. Aidan O'Brien said afterwards: "You’d have to be delighted with that for a first run. He was just ready to run and I was delighted with the way he travelled. "Joseph said he has plenty of speed and he knew after a furlong and a half that he was going better than the others. "We might look at the Round Towers Stakes at the Curragh for him now." The winner cost $120,000 as a yearling, and was sold for a massive 760,000 Guineas at the Tattersalls Craven Breeze-Up Sale in April (a European record breeze-up price). 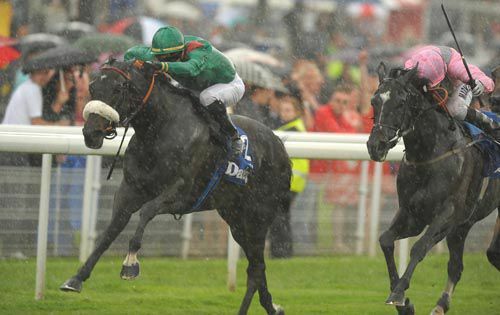 Paddy Power have introduced Great White Eagle into the betting for next year's 2000 Guineas, making him a 16/1 chance. The Aidan O'Brien-trained Mars and Willie Mullins' Simenon, who was last seen finishing second in the Gold Cup at Royal Ascot, are among the entries for the Cox Plate and Caulfield Cup, two of the feature events of the Australian calendar later this year. Jockey/trainer Johnny Murtagh could have an Australian runner in his first training season as Royal Diamond is on the list for the Caulfield Cup along with Dermot Weld's Voleuse De Coleurs. The contests, which form part of Racing Victoria's Spring Carnival meeting, are run on October 26 and October 19 respectively with plenty of European challengers in contention. Last week's Goodwood winner Forgotten Voice and the globetrotting Red Cadeaux are also entered for the Cox Plate. Forgotten Voice was a Group Three winner in Sussex last week and his trainer, champion National Hunt handler Nicky Henderson, has given him the option of this mile and a quarter heat. Andrew Balding's Side Glance, the Hughie Morrison-trained Chil The Kite, David Lanigan's Main Sequence, Guest Of Honour from Marco Botti's yard and Jane Chapple-Hyam's Mull Of Killough hold entries. French runners Maxios, Hammerfest, Mandour and Trevieres complete a list of 12 European entries in the Cox Plate that also features last year's Melbourne Cup hero Green Moon, the highly-rated It's A Dundeel and top mare Atlantic Jewel. A total of 158 horses have been nominated for that race with 173 nominated for the Caulfield Cup over a mile and a half. Green Moon is in that race too, as are all but Side Glance, Mull Of Killough , Guest Of Honour and Chil The Kite. Ed Dunlop's Red Cadeaux is the headline British-trained entry while Lanigan also has Biographer in the reckoning and Botti has entered Dandino and Jakkalberry. William Haggas has entered Sun Central and Stencive, who was beaten by the Sir Michael Stoute-trained Opinion at Royal Ascot and that one is also entered. French possibles include Only A Pleasure, Top Trip and Trevieres while Very Nice Name is also in the frame. Nevis, who was last seen winning the Lingfield Derby Trial for Aidan O'Brien is entered but is now listed as trained by Australian handler Robert Hickmott. St Nicholas Abbey continues to make progress in his recovery from a fractured pastern and a bout of colic. The six-times Group One winner is recuperating at Fethard Equine Hospital and is now eating small amounts, as well as being fed intravenously. Just two days after he underwent a major leg operation, the six-year-old had to have emergency surgery to be treated for colic. 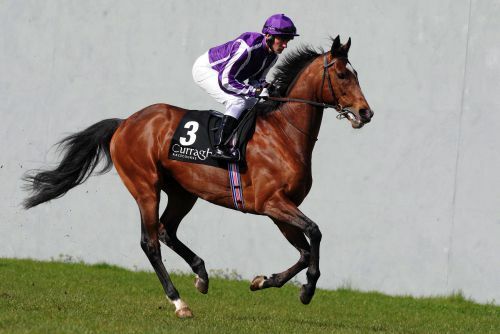 Coolmore tweeted: "St Nicholas Abbey remains in a comfortable condition at Fethard Equine Hospital. "The surgeons and veterinary team are happy with his progress. "He is in good form after another good night and along with receiving intravenous nutrition he is eating small amounts of freshly cut grass."